The first journal issued by the museum was Mitteilungen aus den Königlichen naturwissenschaftlichen Instituten in Sofia — Bulgarien (16 volumes, 1928—1943). It quickly gained international recognition; 62 foreign scientists published their scientific works in the journal and it offered the descriptions of 260 animal and plant taxa, which were new for the science. While the museum was part of the Zoological Institute, it published a journal called Bulletin de l’Institut de zoologie et musée (volumes 10—41, 1961—1974). 1. Historia naturalis bulgarica (1989—). This is the official organ of the museum after it recovered its independence. Most of the articles in it are in foreign languages. It offers scientific contributions in the spheres of zoology, botany, palaeontology and mineralogy and original articles on museology, history of natural sciences and natural history institutions. 2. Biodiversity of Bulgaria (3 volumes, 2001). Each volume of the series is a collection of articles containing published and original information on the animal and plant species in a given region. That marked the beginning of an ambitious concept of regional reviews systematising the information on the regions in Bulgaria, which are interesting from the point of view of fauna, flora, zoogeography and environmental protection. It is the first project of this kind on the Balkan Peninsula. 3. Bureschiana (1 volume, 2008). A series of monographs. The first volume is devoted to the high-mountain terrestrial non-insect arthropods of the Old World. 4. Acarorum Catalogus (volume 1, 2008). The series is a catalogue of acari of the world. The first volume dwells on two super-families. 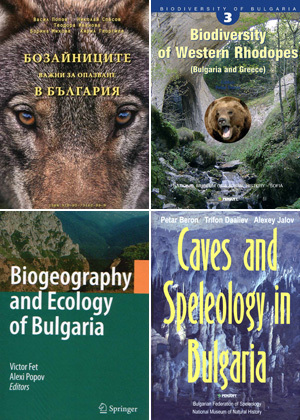 Beside the periodicals, in the last years NMNHS published books as well such as Caves and Speleology in Bulgaria; Biogeography and Ecology of Bulgaria; Prime Butterfly Areas in Bulgaria; Mammals Important for Preservation in Bulgaria and others.